The best houseboat construction is aluminum, steel, fiberglass or wood? The material choices commonly found today for houseboat construction or hulls are typically Aluminum, Fiberglass, Steel, and Wood. Whether you're buying a New or Used House Boat, or contemplating Building your Own Houseboat, which material should you choose? 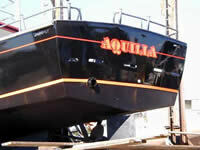 Advantages and Disadvantages of each hull type is of major importance. Each material has it's pros and cons, which should be evaluated accordingly. 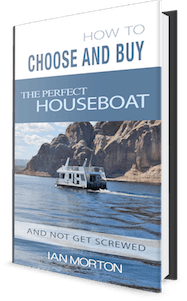 To better understand the differences of each material, follow the choices for houseboat material types such as Aluminum, Fiberglass, Steel, and Wood. Aluminum is the most popular construction material today. It is lightweight, strong, and fairly easily repaired. It has very little problem in regards to corrosion, or rusting, and has excellent longevity. It requires very little maintenance other than yearly checkups of the anode system. One of the drawbacks to aluminum, is that an eye has to be kept on electrolytic corrosion (galvanic corrosion). If you are contemplating building an aluminum houseboat, you will be interested in the article Building an Aluminum Houseboat - Plans. KEYNOTE: an excellent hull material. Fiberglass construction is very common and a popular choice for a construction material. It is lightweight (heavier than aluminum), strong, and also easily repaired. It has very little problems in regards to maintenance, it requires simple waxing, cleaning, compounds of it's gel coat to keep it's LIKE NEW luster. Age, water, and storage conditions can affect the longevity of fiberglass, therefore proper care and maintenance are neccesary. In newer houseboats, steel is a less common material, however is still popular amongst older steel houseboats. 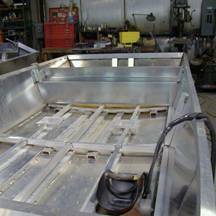 Advantages are that it is strong, difficult to damage, easily repaired, and house boats with steel construction can be quite inexpensive. Disadvantages are that it is an era that is coming to an end. The purchase of a Steel houseboat is definitely not a decision to be taken lightly. From the beginning of time boats were constructed mostly of wood. I'm a firm believer that wood is still one of the most beautiful types of material available. However in all fairness, the time and money involved is not for the faint at heart. Wood has excellent qualities, however for the "average houseboater", it is not the material of choice. The yearly maintenance involved would definitely require some major experience, and a substantial amount of tools for the upkeep. Are you wondering which type, or model to consider? Are you considering Building your Own Houseboat?